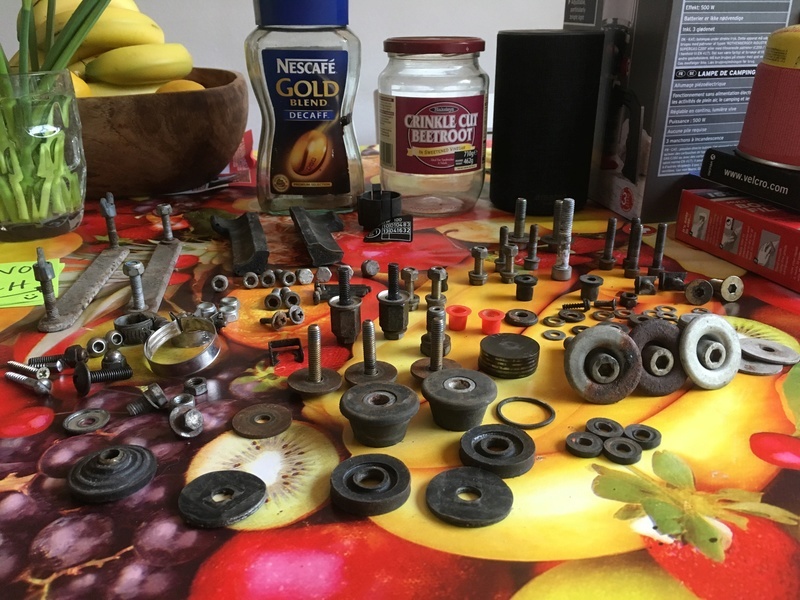 I can remember what a number of these bits is for, based on my previous K bike project. If you want to play this game you will need to zoom in as the fruit oil cloth table cloth makes it harder to see. I tried asking Alexa (top-right) but she is bloody useless!! Look like they are for fairing to mounting fixings, belly pan mounts, foot rest hanger mounts, banana republic coffee. Nice collection. I was at my K earlier and I have a screws box with compartments full of those kind of things. Also lot for the rear mudguard and ducktail. @Inge K. wrote: Also lot for the rear mudguard and ducktail. That could come in handy!! Are you shure they is from a BMW? Why I ask is that I see other screws which definately isn't from a BMW. 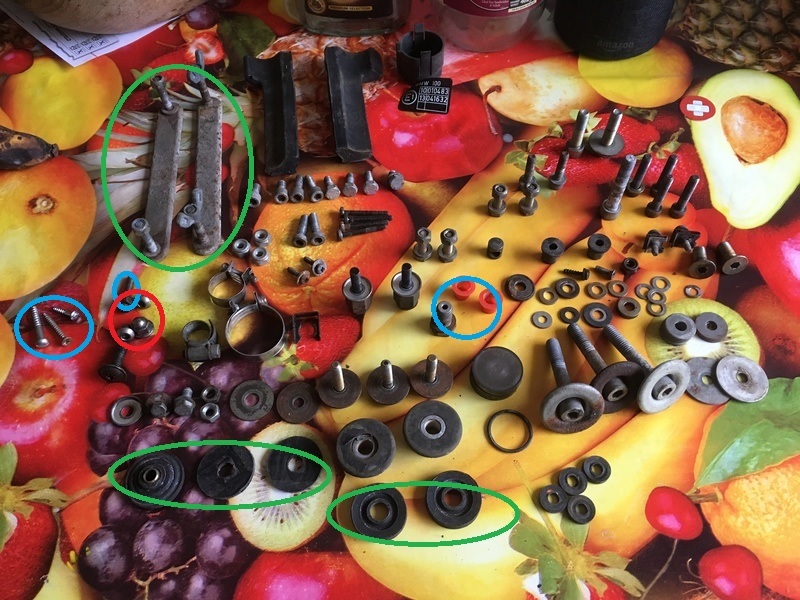 And the screws looks like they is black phosfated which BMW not use. Breakaway mounts for the crash bars. Lets them break free in a drop rather than protect the fairing. I also see a pair of those damn screws that attach the rear brake rotor. @Point-Seven-five wrote: Breakaway mounts for the crash bars. They don't have a dished washer, like here. They have male threads in both ends, here it looks like a through bolt. @Inge K. wrote: Don't recognize them. @Point-Seven-five wrote: Breakaway mounts for the crash bars. Lets them break free in a drop rather than protect the fairing. Thanks for that. I won't fit crash bars as the 'bits' may never fly again to warrant them, but never say never! Oops, said it twice as Harry Hill would say. Green circle: Rear mudguard and ducktail......the big washers far right could also be for this. As .75 have allready said, the countersunk screws far right is for the rear brake disc. Though this is part of brake system? Something to do with fuel tank cushioning? Yes. 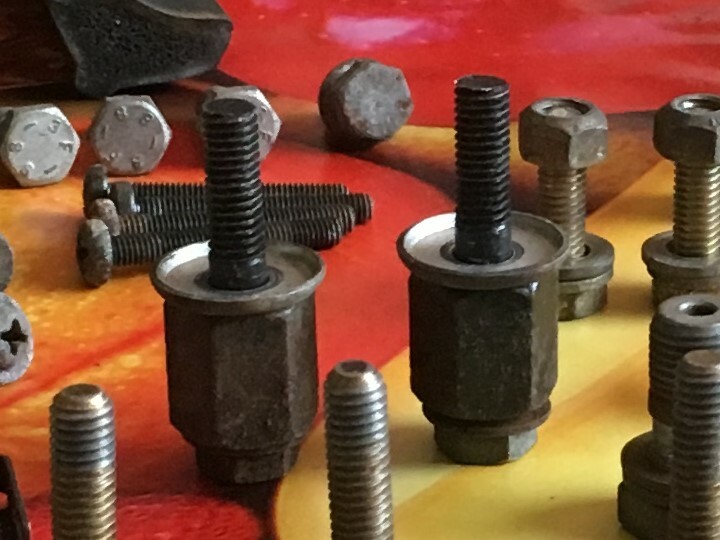 Used on brake line banjo bolt. Yes, of course...... ....upper front, was a bit to quick there. Neal Cooper wrote: Something to do with fuel tank cushioning? Rear end, top of the frame tubes......looks like these have been cutted. Normally it's one piece from the steering head to both rear sides of the tank. Part #16........you also see a Picture in post #29. 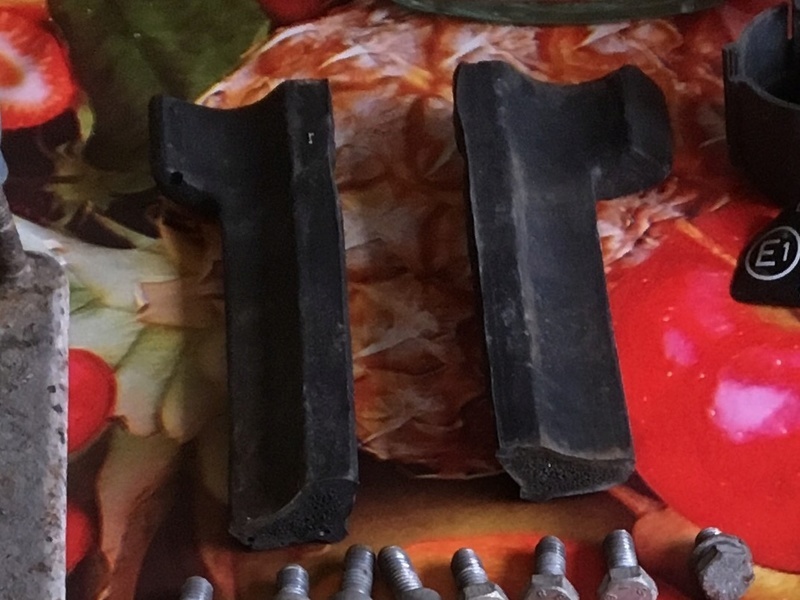 Inge's black phosphated screws are for mounting the latch plates to the back of Krauser pannier frames. 11mm AF, 0.75mm pitch (!!!). The crashbar mounts have been drilled out to take bolts. The two black top-hat-shaped rubber bits go on the spikes on the rear-top of the gearbox and locate in similar cutouts on the front lower edge of the rear mudguard. The small clip left and down from the crashbar mounts holds the folding seat latch to the frame. The circular plastic tube at the top holds the ignition switch. The barrel to the left of the black top-hat-shaped rubber bits is for the handlebar end of the clutch cable. That's the bit that always goes AWOL when the cable breaks, so don't lose it! The spire clips and screws above the top-hats and next to the brake rotor bolts go on the back of the rear frame loop and hold the top of the back mudguard section (the bit that has the numberplate on it). Sorry to anyone who was trying to read this while I kept editing it!!! Now soon every screw have been sorted . hose/pipe change which have been the subject on another thread this day. That I find out about tomorrow. That circlip isn't for the seat, they're a different shape, but I know I have one but cant place it. Aw crap - you're right. Holds the fuel injectors to the distribution rail. Right that's where I've seen it. So whats the little red rubber bits for, they look like Blakey's rubber bits to locate the Ignition module into the frames headstock. Even though the rubbers for that are up and over a bit. I think they are the protective ends put on brake lines to keep wasps building mud pies in the ends. Well I'm embarrassed to say I don't know where they go. I thought they were dolphin torch battery terminal covers. How bad is that? 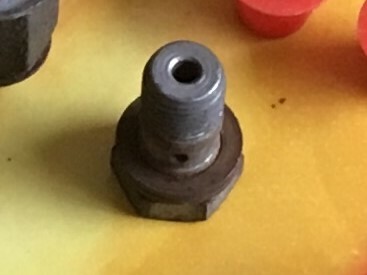 The bits that look like crash bar mounts but are too small I saw a similar thing on the bolts that hold the fuel rail and a tin shield over the injectors. Ahhh - like Rick, I wonder if they're standoffs for fitting one of those nice pretty fuel rail covers? @Dai wrote: Ahhh - like Rick, I wonder if they're standoffs for fitting one of those nice pretty fuel rail covers? great stuff from you all!